A court in Libya's capital sentenced a son of Moammar Gadhafi to death in absentia today over killings during the country's 2011 uprising. The Tripoli court that sentenced Seif al-Islam, who is being held by a militia that refuses to hand him over to the central government, also sentenced to death eight others, including former Libyan spy chief Abdullah al-Senoussi. It was unclear whether the sentences would be carried out. Libya has slid into chaos since the overthrow and killing of Gadhafi. It is now bitterly divided between an elected parliament and government cornered in the country's east, with little power on the ground, and an Islamist militia-backed government in the west that has seized Tripoli. Since the end of the civil war, Seif al-Islam has been held by a militia in Zintan, which is allied with the Tobruk-based internationally recognized government against the Tripoli one. He is also wanted by the International Criminal Court in The Hague on charges of crimes against humanity. Charges in the trial included recruiting mercenaries who were given Libyan nationality, planning and carrying out attacks on civilian targets from the air, forming armed groups and shooting into crowds of demonstrators. A court in Libya issued a death sentence Tuesday to Seif al-Islam, a son of Moammar Gadhafi, in connection with the deadly response to the 2011 uprising that pushed Gadhafi from power. The Tripoli court also sentenced eight others to death, including former spy chief Abdullah al-Senoussi and former prime minister Baghdadi al-Mahmoudi. Seif al-Islam was not in court Tuesday to hear the sentence. His verdict came in absentia because he is being held by a militia in the town of Zintan that backs the internationally recognized government in Tobruk and not the rival Islamist-backed government operating in Tripoli. U.S.-based Human Rights Watch said the trial was "undermined by serious due process violations" and called for an independent review by the supreme court. Seif al-Islam is also wanted by the International Criminal Court on two counts of crimes against humanity. The ICC says he was the most influential person in a Gadhafi government that tried by any means, including use of deadly force, to put down popular protests. The uprising in Libya began in February 2011 in Benghazi with riots inspired by other so-called Arab Spring revolts in Tunisia and Egypt. In March of that year, NATO launched what would be a seven-month campaign of airstrikes under a U.N. mandate to protect civilians from Libyan forces. Gadhafi died in October as forces from the National Transitional Council overran his hometown of Sirte. 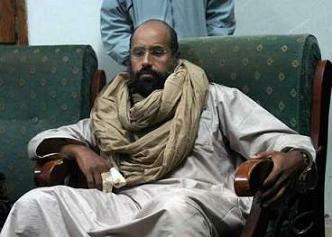 Seif al-Islam was captured a month later. TECHNICAL EXAMINATION – JULY/AUGUST, 2014.